(NaturalNews) Nearly one-quarter of a million men will be diagnosed with prostate cancer this year, accounting for 30,000 deaths from this largely preventable disease. Some forms of prostate cancer are very aggressive, quickly metastasizing to remote area of the body, while other forms remain localized and grow slowly so they never threaten the life of the individual. Prior research studies have demonstrated that cancerous cell growth is promoted by a diet consisting largely of hydrogenated fats and excess sugar, as well exposure to household and environmental pollutants. A research study team from the School of Medicine at The University of Texas Health Science Center in San Antonio has released the results of a study in the journal, Cancer Investigation that explains how eating a modest amount of walnuts can protect against prostate cancer. Past studies have shown a reduced incidence of breast cancer related to walnut consumption and scientists wondered whether a walnut-enriched diet versus a non-walnut diet would be associated with reduced cancer development. Using a mouse model that simulates human prostate cancer, investigators injected immune-deficient mice with human prostate cancer cells. Within three to four weeks, tumors typically start to grow in a large number of these mice. 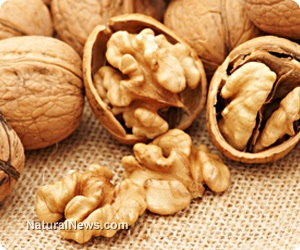 Researchers found that three of sixteen mice (eighteen percent) eating the walnut-enriched diet developed prostate tumors, compared with fourteen of thirty two mice (forty four percent) on the non-walnut control diet. Additionally, the average tumor size in the walnut-fed animals was one-fourth the average size of the prostate tumors that developed in the mice eating the control diet. Senior study author, Dr. Russell Reiter commented "We were absolutely surprised by how highly effective the walnut diet was in terms of inhibition of human prostate cancer." The positive results gleaned from this study did not reflect a large consumption of walnuts. Mice were fed a pulverized walnut mix that was equivalent to a human consuming about two ounces every day, roughly equal to a large handful or 28 walnut halves. Dr. Reiter concluded "The data to date suggest that using walnuts on a regular basis in the diet may be beneficial to defer, prevent or delay some types of cancer, including breast and prostate." Walnuts have demonstrated human health benefits ranging from reduced incidence of heart disease, cognitive decline, men's reproductive health, many forms of cancer, optimization of blood lipids and weight management. Present research indicates that two ounces eaten daily can help prevent a myriad of chronic disease conditions.